Clowns are supposed to be jovial, happy friendly souls, but I've always found them sinister (even the really nice ones). Maybe it's to do with their unpredictability or perhaps I've seen one scary movie too many, but clowns freak me out and I know it's not just me. So I won't be the only one who wouldn't like to bump into a pint size person in this Scary Clown Kids Fancy Dress Costume at Halloween (or any other time for that matter). The costume is available in two different sizes - medium (age 7-9) and large (10-12). The outfit includes a a colourful top with attached black pom poms and ruff, a pair of matching trousers and a pair of gloves. Also included is a fabulous pair of 10 inch long clown shoes with faces on them! 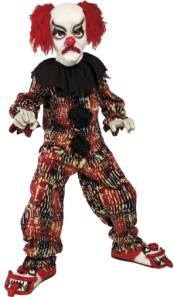 A scary clown mask with attached red hair completes this Halloween outfit for kids.